You can download the first volume of Bradley P. Beaulieu's The Lays of Anuskaya, the excellent The Winds of Khalakovo, for only 2.51$ here. Among inhospitable and unforgiving seas stands Khalakovo, a mountainous archipelago of seven islands, its prominent eyrie stretching a thousand feet into the sky. Serviced by windships bearing goods and dignitaries, Khalakovo’s eyrie stands at the crossroads of world trade. But all is not well in Khalakovo. Conflict has erupted between the ruling Landed, the indigenous Aramahn, and the fanatical Maharraht, and a wasting disease has grown rampant over the past decade. Now, Khalakovo is to play host to the Nine Dukes, a meeting which will weigh heavily upon Khalakovo’s future. When an elemental spirit attacks an incoming windship, murdering the Grand Duke and his retinue, Prince Nikandr, heir to the scepter of Khalakovo, is tasked with finding the child prodigy believed to be behind the summoning. However, Nikandr discovers that the boy is an autistic savant who may hold the key to lifting the blight that has been sweeping the islands. Can the Dukes, thirsty for revenge, be held at bay? Can Khalakovo be saved? The elusive answer drifts upon the Winds of Khalakovo. . . The second installment, The Straits of Galahesh, is also available for 3.79$ here, as is the third volume, The Flames of Shadam Khoreh here. In addition, you can also download Beaulieu's collection of short fiction, Lest Our Passage Be Forgotten, for only 2.51$ here. 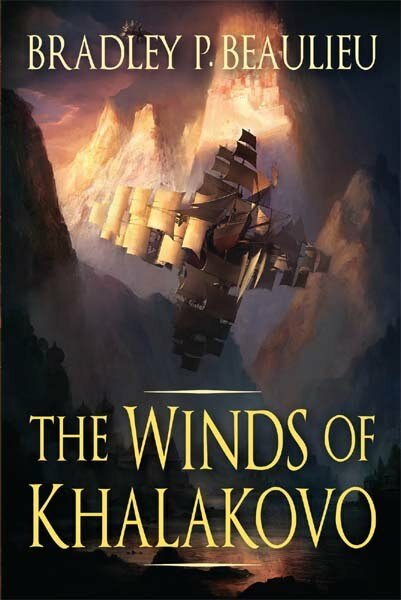 With The Winds of Khalakovo, Bradley P. Beaulieu established himself as a talented new voice in epic fantasy. With his premiere short story collection, Beaulieu demonstrates his ability to weave tales that explore other worlds in ways that are at once bold, imaginative, and touching. 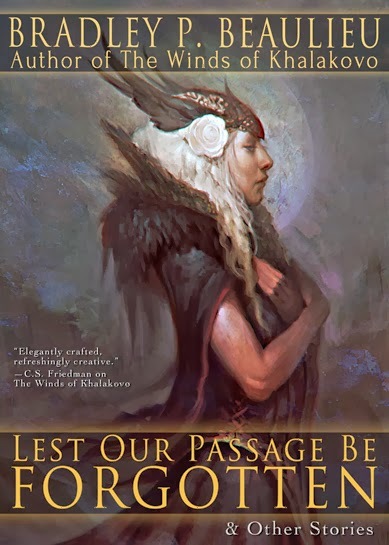 Lest Our Passage Be Forgotten and Other Stories contains 17 stories that range from the epic to the heroic, some in print for the first time. Margaret Weis and Robert Krammes contest winner! Peter F. Hamilton contest winner! Why didn't you. . .